Set of 9 pairs Symfonie Dreamz Single Point Needles packaged in an elegant black jacquard fabric case. Sizes included are US 2.5, 4, 5, 6, 7, 8, 9, 10, and 11. Each size is a distinctive & radiant color for easy identification and organization. Polished wood surface works effortlessly with every type of yarn. The knitter's favorite needle, providing hours of pleasurable knitting with no hand fatigue. Dreamz needles are made from densified laminated birch wood. This material is more costly and much harder than either ebony or rosewood. Unlike in other wooden needles, water absorption in Symfonie wood needles is negligible and, as a result, there is no chance of warping. The same property makes these needles very strong, enables the points to be sharp and provides a lifetime of pleasurable use, if handled correctly. Please remember that all wooden needles in the lower ranges (2.0mm-3.5mm) should be treated with appropriate care. 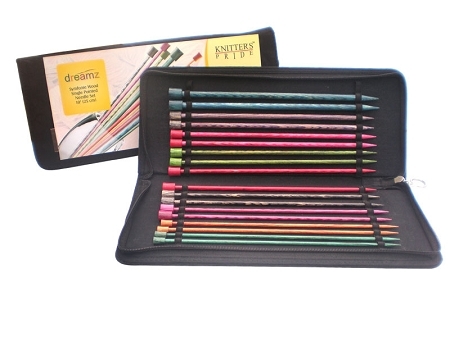 The Dreamz line of needles is offered in a full range of 11 radiant colors. A color has been assigned to each size and that color carries through in all the needle styles: straight, circular (fixed and interchangeable), double points, and crochet hooks. Imagine how this aids in organizing your collection. It also provides ease of identification for partially sighted knitting and/or crochet artists.